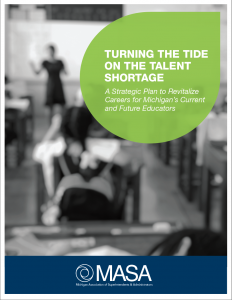 In December 2017, MASA convened the Educator Shortage Workgroup (ESW) which included 21 superintendents representing regions from across the state to address the educator shortage problem that most districts are experiencing. In addition to the several ESW meetings and the group’s reading and research, the ESW also met with other stakeholders who share our mutual challenge (MDE leaders, college deans, marketing experts, etc.) before carefully brainstorming actionable strategies to address the growing gaps in effectively staffing our schools. Click here to read the Strategic Plan.